by Bob Morrison, Contributing Author: I can remember when I did not love Christ, but I cannot remember when I did not love Christmas. And part of my earliest Christmas memories was watching a movie my parents loved, the English version of A Christmas Carol. Charles Dickens' little novel has been a part of the season for English-speaking peoples since its first appearance in 1843. It was so popular that even a century later, President Roosevelt made it a family tradition to read the entire story to his children every Christmas Eve. The White House was keen to let the whole country know it. One suspects that FDR shrewdly used Dickens' story of the redemption of the miserly old London grain broker, Ebeneezer Scrooge, to let Americans know what he thought of his bitter opponents on Wall Street and in the GOP. The movie version was scary, too, especially for young kids. The ghost of Scrooge's long-dead business partner, Jacob Marley, manages to come through the locked and bolted heavy oaken door to Ebeneezer's bedchamber. Only very rich English people had bedchambers. "Old Marley was dead as a doornail," we are informed. But there he is on screen moaning and shaking his chains. Those chains are attached to clunky cash boxes. He is condemned in death to lug those strongboxes with him wherever he goes. But there is merriment in this story from Victorian England. Scrooge's nephew Fred, son of his late sister, is a kindly, forgiving soul. He tries to get his uncle to push back from his desk, to take one day away from getting and spending, and to join in the holiday revelry. The same people who urged us to "deck the halls with boughs of holly" wanted us to have a party. Scrooge will have none of it. "Bah, Humbug," he says. "If I could work my will," Scrooge tells his nephew, "every idiot who goes about with 'Merry Christmas' on his lips would be boiled with his own pudding and buried with a stake of holly through his heart!" That would be figgy pudding, of course. There are many things from which I might have derived good, by which I have not profited, I dare say, Christmas among the rest. But I am sure I have always thought of Christmastime, when it has come around—apart from the veneration due to its sacred name and origin, if anything belonging to it can be apart from that—as a good time, a kind, forgiving, charitable, pleasant time; the only time I know of, in the long calendar of the year, when men and women seem by one consent to open their shut-up hearts freely and to think of people below them as if they really were fellow passengers to the grave and not another race of creatures bound on other journeys. And therefore, Uncle, though it has never put a scrap of gold or silver in my pocket, I believe that it has done me good and will do me good; and I say God bless it!Dickens's London was as proud and pompous and powerful then as our City of Washington is today. His character Fred was doubtless thinking of England's urban poor when he spoke of caring for "people below them," and maybe even of the slaves' unrequited toil in the American South. Their consciences stirred by the writings and works of Evangelical Christians like William Wilberforce, the English people of the Victorian Era were sincerely and passionately anti-slavery. When some of his fellow businessmen ask Scrooge for a small contribution—gold or silver will do--to relieve the poor at Christmas, he says the poor should go to the workhouse. "They would rather die," says one of the volunteers. "Then let them die," says Scrooge, "and decrease the surplus population!" Today, in Washington, great forces contend, usually over silver and gold. We recently saw Dr. Jonathan Gruber testify before Congress. Gruber is the one who boasted to an academic audience of how stupid the American voters are and how good it was to make the health care legislation so "opaque" that neither the people nor Congress could figure it out. Gruber has written of the great benefit to America of Roe v. Wade. It has eliminated millions of poor and perhaps criminal people and saved the taxpayers fourteen billion dollars, Gruber said. He might have added: "Let them die and decrease the surplus population." So, it's not surprising that the Bah Humbug Lobby--those folks who want to banish Christmas from the public square--are also the ones so eager to reduce the surplus population. But I'll vote with Scrooge's nephew, Fred. Bob Morrison is a Senior Fellow for Policy Studies at the Family Research Council. He has served at the U.S. Department of Education with Gary Bauer under then-Secretary William Bennett. He is a contributing author to the ARRA News Service. Tags: Bob Morrison, God, Sinners, reconciled, To share or post to your site, click on "Post Link". Please mention / link to the ARRA News Service. and "Like" Facebook Page - Thanks! Tags: ARRA News Service, Christmas, Merry Christmas, 2014, Christ's Birth To share or post to your site, click on "Post Link". Please mention / link to the ARRA News Service. and "Like" Facebook Page - Thanks! What Christmas Means to Americans . . .
. . . There’s no war on Christmas in our hearts. Despite annual controversy surrounding religious holiday displays, nearly 3 out of 4 Americans believe Christian symbols should be allowed on government property, according to the Pew Research Center. Pew found that 44 percent of Americans believe Christian symbols such as the nativity scene should be allowed on government property, even if other religions’ symbols are not present. Twenty-eight percent believe Christian symbols should be allowed only if symbols from other religions, such as a menorah, are included as well. A smaller 20 percent say no religious displays should be permitted on government property. But 72 percent believe Christian symbols should be allowed on government property in some way, either alone or accompanied by other religious symbols. Nearly half believe these symbols can be displayed only if other religious symbols are displayed along with them. 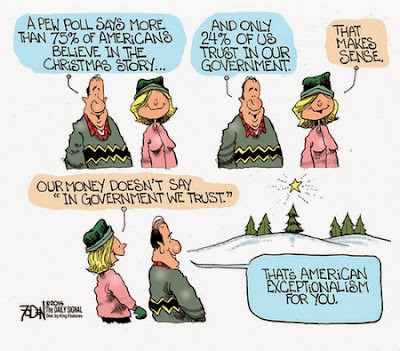 Tags: Christmas, means, America, Pew Research, editorial cartoon, Glenn Foden, Pew Research To share or post to your site, click on "Post Link". Please mention / link to the ARRA News Service. and "Like" Facebook Page - Thanks! by Gary Bauer, Contributing Author: A Good Week For Tyrants - Castro is crowing in Cuba. The mullahs are merry in Tehran. Kim Jong-un is kicking it up in North Korea. And Obama is back on the golf course. Saturday, Cuban President Raul Castro delivered an hour-long victory speech before the Cuban National Assembly. The communist spies released by Obama were given a hero's welcome. A gloating Castro declared, "Now we've really won the war." He went on to state that any economic reforms would be intended to promote "prosperous and sustainable communism." And just to clear up any lingering confusion about Obama's normalization of relations, Castro bluntly stated, "No one should believe that improving relations with the United States means Cuba renouncing its ideas." The Obama White House made mindboggling concessions to the Cubans. What exactly did we get out of it? Those nuclear negotiations just got a lot harder. The Iranians had little incentive to negotiate in good faith before. After seeing Cuba's resistance get rewarded, they have zero incentive to do anything now. Meanwhile, the administration's non-response to North Korea's cyberattack on Sony continues to disappoint. Before heading off for his Hawaiian vacation, Obama downplayed the attack on Sony as just "cyber-vandalism." Today's Washington Post reports that administration officials asked for China's help in responding to North Korea's attack. That's insane! There is evidence that China likely helped the North Korean hackers. Not surprisingly, Beijing declined to lift a finger. Yesterday Internet service in North Korea went down for nine hours. Some speculate this might have been U.S. retaliation for the Sony attack, I mean vandalism. If that was Obama's idea of a "proportional response," it was a waste of time. Temporarily annoying the hackers by taking down their Internet service for few hours is meaningless. According to the Associated Press, North Korea is "one of the least-wired and poorest countries in the world." The AP adds that taking down North Korea's Internet would be a purely "symbolic" gesture and "probably more inconvenient to foreigners." There is much more the administration could do to tighten sanctions and further isolate the Stalinist regime. But given Obama's penchant for rewarding our enemies, I won't hold my breath. The Left's Hate Speech - New York City Mayor Bill de Blasio, Attorney General Eric Holder and Al Sharpton have been scrambling for cover since Saturday's assassination of two New York City police officers. They are trying to deny any responsibility for the shooting deaths of Rafael Ramos and Wenjian Liu, in spite of months of rhetorical attacks against law enforcement. But the left can't have it both ways. The Oklahoma City bombing took place during a time when conservatives were warning that government was becoming too big and too powerful. President Bill Clinton immediately seized on that horrible event and attempted to twist normal conservative beliefs about limited government into "hate speech," blaming the bombing on Rush Limbaugh and "hate radio." I also recall well how the pro-family movement was collectively blamed for the death of Matthew Shepard. Conservatives spent months trying to beat back those canards. By the left's own standards, Obama, Holder, de Blasio and Sharpton must bear some culpability for the deaths of Officers Ramos and Liu. Obama encouraged Al Sharpton at the White House to keep the protests "on course." And we know that there is a significant element among the political left that is prone to violence. The Occupy Wall Street movement amassed quite a rap sheet. The deaths of Trayvon Martin, Michael Brown and Eric Garner have been exploited to push a left-wing narrative and inflame racial discord. But there was zero evidence of racism in any of those cases. And in the cases of Brown and Garner, the evidence didn't even support charges of excessive force by the police. Grand juries refused to indict the police officers, but that didn't stop the left from indicting all cops collectively and American society generally. Sadly, it's not surprising that after months of stoking tensions, a weak response to riots in Ferguson, no defense of the rule of law and no condemnation of radicals chanting, "What do we want? Dead cops! When do we want it? Now," that someone would act to fulfill that chant. Saturday night, the head of New York City's police union said that there was "Blood on many hands." He's right. The left deserves its share of collective blame. Attempting to restore calm to his city yesterday, Mayor de Blasio asked that the protest be suspended until Officers Ramos and Liu are buried. That seems eminently reasonable. 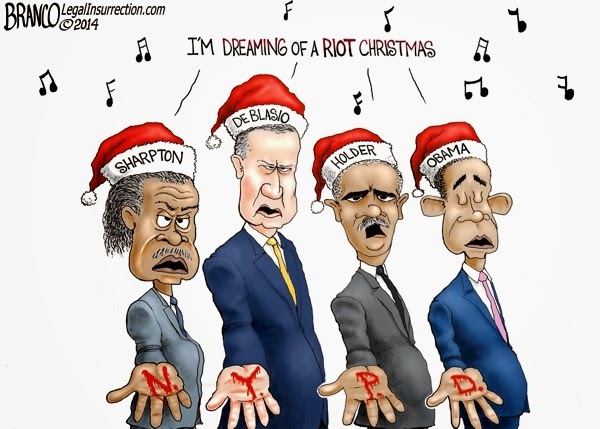 But, of course, Al Sharpton is refusing to cooperate. Hope And Blessings - Christmas is a time of hope and blessings, a celebration of life and salvation. The Scriptures teach us that children are a blessing from God. It has also been said that the birth of each new child is a sign that God has not yet given up on this world. 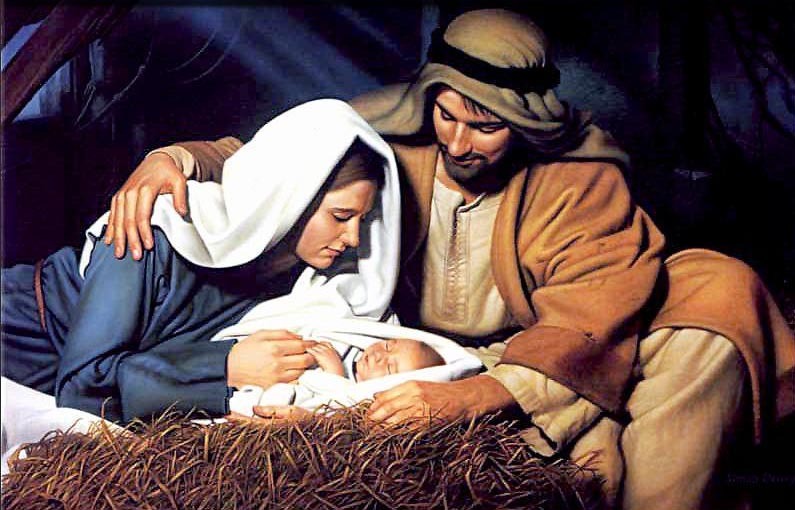 That was never more true than the night two thousand years ago when the Son of Man was born in Bethlehem; born to bring the hope of salvation and the blessing of eternal life. 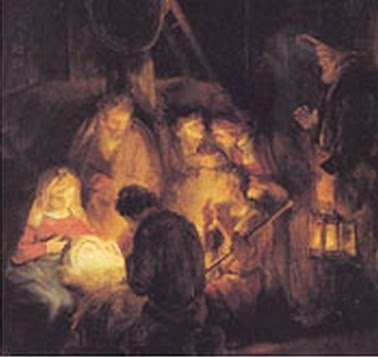 When the Christ Child came into the world, his cry pierced the night and split all of human history in half. During a sermon in 1926, Reverend James Allan Francis summarized the profound impact of life of Jesus Christ. No doubt many of you will recognize his words:Here is a man who was born in an obscure village as the child of a peasant woman. He grew up in another obscure village. He worked in a carpenter shop until he was thirty and then for three years was an itinerant preacher. He never wrote a book. He never held an office. He never owned a home. He never had a family. He never went to college. He never put his foot inside a big city. He never traveled two hundred miles from the place where he was born. He never did one of the things that usually accompany greatness. He had no credentials but himself. He had nothing to do with this world except the naked power of his divine manhood. While still a young man the tide of popular opinion turned against him. His friends ran away. One of them denied him. Another betrayed him. He was turned over to his enemies. He went through the mockery of a trial. He was nailed upon the cross between two thieves. His executioners gambled for the only piece of property he had on earth while he was dying, and that was his coat. When he was dead, he was taken down and laid in a borrowed grave through the pity of a friend. Nineteen wide centuries have come and gone and today he is the center of the human race and the leader of the column of progress. I am far within the mark when I say that all the armies that ever marched, and all the navies that were ever built, and all the parliaments that ever sat and all the kings that ever reigned, put together, have not affected the life of man upon the earth as powerfully as has this one solitary life.No one can predict the headlines in the weeks and months ahead, but we can rest assured that one day every head will bow and every knee will bend before the King of Kings. While the focus of Christmas is, of course, Christ's birth in Bethlehem, I can't escape Christmas' unique role in the birth of our nation. It was on Christmas night in 1776 that General George Washington crossed the Delaware River and launched a daring surprise attack on the Hessian mercenaries. Washington's victory at the Battle of Trenton was a turning point in the American Revolution. Surely God was there, and I pray that the God of Abraham is with us still! My friends, I thank God for each and every one of you. Your prayers and encouragement sustain me as we continue to fight the good fight for faith, family and freedom. Merry Christmas! And may you enjoy all of God's richest blessings in the year ahead. Tags: Gary Bauer, Campaign for Working Families, Tyrants, Left's Hate Speech, Hope, Blessings To share or post to your site, click on "Post Link". Please mention / link to the ARRA News Service. and "Like" Facebook Page - Thanks! 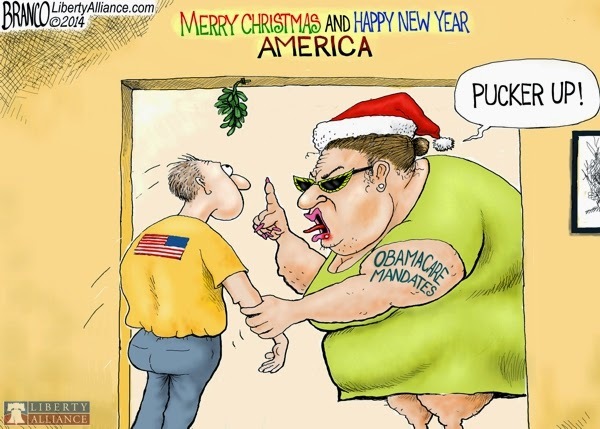 Mandated Cheer . . .
. . . Obamacare mandates bringing in the New Year. Tags: President Obama, mandated cheer, Obamacare mandates, Merry Christmas, Happy New Year, America, editorial cartoon, AF Branco To share or post to your site, click on "Post Link". Please mention / link to the ARRA News Service. and "Like" Facebook Page - Thanks! 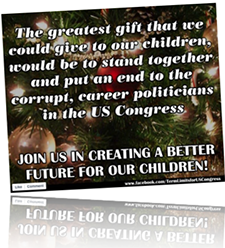 by Paul Jacob, Contributing Author: In the spirit of giving, good will, peace, harmony, and important institutional reform, how about giving ourselves and our posterity a generous helping of congressional term limits? Merry ChristmasAlso, don’t expect a constitutional term limit amendment proposed by Congress to be wrapped up in a bow under our Christmas trees this holiday season . . . or the next. That gift, which our elected representatives could give to us, is not on the list they check twice. Paul Jacobs is author of Common Sense which provides daily commentary about the issues impacting America — and about the citizens who are doing something about them. He is a contributing author on the ARRA News Service. Tags: NCongressional Term limits, Paul Jacob, Common Sense To share or post to your site, click on "Post Link". Please mention / link to the ARRA News Service. and "Like" Facebook Page - Thanks! by Phyllis Schlafly: There are 250 million Christians in America today, but most seem to be oblivious of the fact that they and their religion are under steady attack from those who apparently hate Christianity, or at least want to expunge Christianity from any public place or mention. That hatred seems to extend to all sorts of evidences of Christianity in our society such as Christmas, which is a federal holiday. When news of the secret plan leaked out, parents forced the issue to be confronted at a PTA meeting, but parents were accused of being discriminatory if they supported the trip to see the Nutcracker ballet. The good news is that common sense prevailed and parents won the Nutcracker battle, but many believe it will come up again next year and in other schools, too. No town or school is too small to escape the wrath of those who hate Christmas. The atheists went after the annual Christmas parade in Piedmont, Alabama, a small town in the foothills of the Appalachian Mountains. The Piedmont parade isn’t as spectacular as those in big cities, but it does feature the local high school marching band, Santa Claus on a bright red fire truck, local girls who had won beauty pageants, and the Piedmont High School track team which had just won the state championship. When the parade committee selected “Keep Christ in Christmas” as the theme of this year’s parade, nobody thought that was controversial. But suddenly the little Alabama town was confronted by a noisy group of atheists from Wisconsin called the Freedom From Religion Foundation. The Colorado Supreme Court dismissed a legal challenge to Governor John Hickenlooper’s Day of Prayer proclamation, which is an annual Colorado tradition announced to coincide with the National Day of Prayer. The legal challenge had been filed by those ubiquitous busybodies from Wisconsin, the Freedom From Religion Foundation. Writing on behalf of the 5-2 majority, Colorado Chief Justice Nancy Rice ruled that the lawsuit failed to show any “injury sufficient to establish individual standing.” In other words, no harm was done by the annual honorary proclamation. Of course, the Freedom From Religion organization is continuing its drive to establish a new “right not to be offended.” These atheists are determined to silence our freedom of speech in the process. Another important victory for religion occurred last fall in Oklahoma. State Representative Mike Ritze spent $10,000 of his own money to pay for the construction of a Ten Commandments monument that was placed on the grounds of the State Capitol with the approval of the State Legislature, but no public money was ever spent on it. It was part of a 100-acre complex that has more than 50 other monuments. The ACLU then sued, claiming that the monument on Capitol grounds violates the state constitution’s ban against using public property to support a religion. The ACLU made a curious argument, claiming that its plaintiffs were not offended by the Ten Commandments, but were offended that the government was using something sacred for political purposes, and the monument’s presence at the State Capitol cheapened a sacred text. Shortly after this court victory, a man drove his car into the monument, smashing it into pieces. Oklahoma State Representative Mike Ritze is now building an identical Ten Commandments monument. The ACLU shouldn’t be optimistic about its chances on appeal because Ten Commandments monuments have been consistently upheld. Tags: War Against Christians, Christmas, Christians,ACLU, Phyllis Schlafly, Eagle Forum To share or post to your site, click on "Post Link". Please mention / link to the ARRA News Service. and "Like" Facebook Page - Thanks! by Alan Caruba, Contributing Author: As usual, those for whom laws, ethics, and good will mean nothing have come together to try to ruin Christmas for the rest of us. Alan Caruba is a writer by profession; has authored several books, and writes a daily column, Warning Signs". He is a contributor to the ARRA News Service. Tags: Ruining Christmas, 2014, Alan Caruba, Warning Signs To share or post to your site, click on "Post Link". Please mention / link to the ARRA News Service. and "Like" Facebook Page - Thanks! Shocker -- The US government is offering $5 million for the capture of an Al Qaeda terrorist it released from Gitmo. Not a Shocker -- Terrorist released from Gitmo are still dangerous terrorists after "rehabilitation." However, to be fair, this terrorist was released under President Bush. But stories like this should obviously give President Obama pause as he ramps up Gitmo transfers. But will it? Special Report by Judicial Watch: Years after liberating an Al Qaeda operative from the military prison at Guantanamo, the United States government has put him on a global terrorist list and offered a $5 million reward for information on his whereabouts. The unbelievable story comes as President Obama frees more and more terrorists—including four to Afghanistan over the weekend— long held in the military compound at the U.S. Naval base in southeastern Cuba. The president’s goal is to close the prison, a campaign promise that dates back to 2008, by relocating the last of the world’s most dangerous terrorists. Still left at the facility are 9/11 masterminds Khalid Sheikh Mohammed (KSM), Ramzi Binalshibh, Ali Abdul Aziz Ali, and Mustafa Ahmed Adam al Hawsawi as well as USS Cole bomber Abd al-Rahim al-Nashiri. Hundreds of Gitmo terrorists have been discharged over the years under a program that started with President George W. Bush and continued full-throttle with this administration. Intelligence report after intelligence report has revealed that many rejoin terrorist missions after leaving the military prison. In fact, Judicial Watch has been reporting this for years. Back in 2010 JW wrote about a report that the Director of National Intelligence gave Congress documenting that 150 former Gitmo detainees were confirmed or suspected of “reengaging in terrorist or insurgent activities after transfer.” At least 83 remained at large, according to the document. Now we learn that the U.S. government is secretly admitting that it erred in at least one case, the release of a Saudi national named Ibrahim al-Rubaysh. In late 2006 the Bush administration repatriated him back home under a Saudi Arabian “rehabilitation” program that supposedly reformed Guantanamo Bay jihadists but instead has served as a training camp for future terrorists. 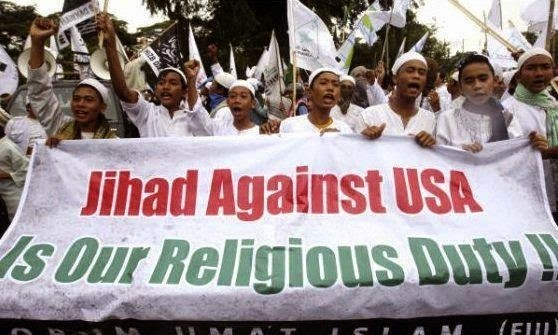 In fact, in 2008 counterterrorism officials confirmed that many of the terrorists who return to “the fight” after being released from U.S. custody actually graduated from the laughable Saudi rehab program, which started under Bush and continued under Obama. Tags: Judicial Watch, report, U.S offers reward, Al Queda Terrorist, released from GITMO, Gitmo, terrorist, corruption chronicles To share or post to your site, click on "Post Link". Please mention / link to the ARRA News Service. and "Like" Facebook Page - Thanks! 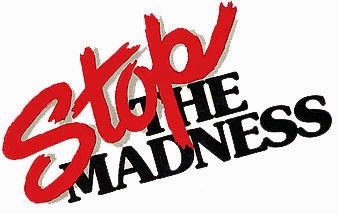 The Madness Method Of The Social Security Administration? On yet another way our government behaves like criminals . . .
by Paul Jacob, Contributing Author: To those nattering nabobs of negativity who don't trust government to do the right thing, or even to stop doing the wrong thing once discovered, I just want to say: "You're right." Last April, a Washington Post exposé about a bizarrely tyrannical debt collection program caused the Social Security Administration (SAA) to publicly promise it would cease and desist from said program. The Social Security bureaucracy had been snatching the tax refunds of grown children -- $75 million from roughly 400,000 victims -- whose parents, many decades ago, had allegedly been sent excess money by this same incompetent outfit. Due process? The SSA didn't go before a judge to prove these people owed a valid debt, nor even bother to inform folks that their income tax refunds were being seized. Instead, the Social Security gang just flat-out took the money . . . surreptitiously, like a thief. In some cases, the SSA wasn't certain who exactly owed the money. In one case, the agency went after a child even when they could find the mother who supposedly owed the money. Why? The mother had already beaten them in court. Hasn't this been settled law for at least the last couple of centuries? After publicity back in April, the agency's commissioner announced it would stop. Yet, now the Social Security Administration is right back at it, claiming Congress has given it the legal power to collect debts "as it sees fit." You see why governments need limits. Because they take liberties. Tags: Paul Jacob, Common Sense, Social Security Administration, SSA, Madness method, To share or post to your site, click on "Post Link". Please mention / link to the ARRA News Service. and "Like" Facebook Page - Thanks! 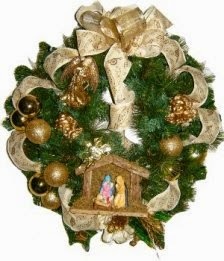 by Allen West: It’s beginning to look a lot like Christmas, if you’re a detainee. Come on everyone, sing along! In yet another violation of the U.S. Constitution, Article I, Section 8, Clause 11 — President Barack Obama has released four more GITMO detainees — what a nice Christmas gesture. Just in case you haven’t been paying attention, some five GITMO Islamic terrorists were released to Uruguay and are living la vida loca in that South American country. Just last week, three Cuban spies, who have the blood of Americans on their hands, were released back to Cuba in a prisoner swap. Don’t forget, the five senior Taliban leaders will be eligible to return to Afghanistan next year from their heavenly exile to Qatar. And just where is ol’ Army SGT Bowe Bergdahl? The full report on his case was completed about three months ago. Obviously the Pentagon has it and the Secretary of the Army knows the findings – why won’t anyone share? Okay, so let me pose the obvious question — when does Obama release U.S. Army 1LT Clint Lorance, whose story we reported on here? How about caring for the goodwill and reunion of LT Lorance with his family? Here is a young man who volunteered to answer his nation’s call after 9-11 and enlisted into the Army — and then sought greater responsibility after attending college earning his degree and commission as an officer. So, if Mssrs. Zahir, Khan, Ghani, and Gul are deserving freedom, how can this administration be so dismissive and obstinate as to imprison – wrongly, I may add — one of our own? How is it that this Obama administration cares so much about these Islamic terrorists that our men and women fought hard to get off the battlefield — yet cared little for twice-deployed U.S Marine SGT Andrew Tahmooressi? Simply put, I ain’t buying any of this. Is a political promise to shut down GITMO more important that our own warriors? Apparently so. Or perhaps the real goal of Obama’s olive branch for Cuba is to turn the GITMO territory back to Cuba before exiting the White House and proclaim he has forever shut down the U.S. Base at Guantanamo Bay. You see, in the minds of the progressive socialist left and the Obama camp, this is how you fight against Islamic terrorism. You condemn your own nation for “enhanced interrogation techniques” and release those captured — not within the executive branch’s enumerated power — as a sign of good will. The lesson the enemy learns is that we are benevolent suckers. When in the history of warfare have prisoners — in this case unlawful enemy combatants — ever been released before combat hostilities have concluded, with documents signed by both parties, normally the loser? We are rewarding the belligerence of the enemy with kindness, and even more disconcerting, the Obama administration has vowed to leave some 10,800 troops in Afghanistan — for what? Perhaps they can go by and tuck in these released terrorists every night and give them warm goats milk and cookies. And we ask why the morale of our military is at an incredible low. Obama issued a statement last Friday objecting to congressional restrictions on closing Guantanamo — you know, they shouldn’t exert their Constitutionally-granted enumerated powers. He said shutting down the detention facility was a “national imperative” (actually a partisan political imperative for Obama). He also noted that the U.S. recently ended its operations of prisons for suspected terrorists in Afghanistan by releasing the final three detainees from the Parwan Detention Center — I suppose if Obama declares combat operations are over, then there’s no enemy. So who are the folks who just killed two American troops a week ago in an attack on a convoy? So my understanding is that if you’re just an Islamic terrorist private you’re ok — regardless if you were on the battlefield shooting at Americans. This is without a doubt one of the most insidious policy decisions and classifications of the enemy. Folks, I must confide that after these final two years of the Obama presidency, America will need a warrior statesman — not another politician. After Sir Neville Chamberlain there came a Winston Churchill — so there is always hope. Allen West (LtCol-Ret., USA) served in several combat zones including Operation Desert Storm and Operation Iraqi Freedom. He served as a civilian military adviser to the Afghan army (2007-2007). In 2010, he was elected to the United States Congress (R-FL-22). He is a Fox News Contributor, a Senior Fellow at the London Center for Policy Research. Tags: Allen West, President Obama, Afghanistan, Clint Lorance, GITMO, SGT Bowe Bergdahl To share or post to your site, click on "Post Link". Please mention / link to the ARRA News Service. and "Like" Facebook Page - Thanks! Bill O'Reilly was supposed to be off for Christmas break, but he couldn’t stay silent on his views about the Saturday shooting of two New York City police officers. Phoning into his own Fox News show, “The O’Reilly Factor,” he called tonight for the resignation of New York Mayor Bill de Blasio. Watch his “no spin” take on the situation in the above FoxNews video. Tags: The O'Reilly Factor, Bill O'Reilly, calls for, New York City, Mayor Bill de Blasio, to resign, shooting of police officers, opinions, New York police To share or post to your site, click on "Post Link". Please mention / link to the ARRA News Service. and "Like" Facebook Page - Thanks! leftist agenda & rhetoric has put officers in danger. by Ali Meyer, CNS News: The assassination of two police officers in New York City on Saturday; and the deadly attack on a Tarpon Springs, Fla. police officer one day later have boosted the toll of police deaths to 114 for 2014. More than half of the officers killed were attacked in some way. And the year is not over yet. As of early Tuesday, 114 police officers were listed on the 2014 Honor Roll of Heroes compiled annually by the Officer Down Memorial Page (ODMP). That's already more than the 105 officers who died in 2013. More than half of the 114 deaths were due to some form of assault and were non-accidental. They include two police officers who died as a result of assault, 46 killed by gunfire, including NYPD Officers Rafael Ramos and Wenjian Liu; and 10 killed in vehicular assaults, which totals to 58 of the 114, or 50.87 percent. The other 56 deaths were accidental, with 26 killed in vehicle crashes, one police officer who drowned, another who died in a fire, two killed by accidental gunfire, 15 killed because of heart attacks, three who died in motorcycle accidents, three who were struck by a vehicle, and five who died in a vehicle pursuit. All but four of the officers who have died so far in 2014 were men; the average age was 40, and the average tour of duty was 12 years, 6 months. California (14), Texas (11) and New York (7) had the most officer deaths this year. And May 2014 was the deadliest month, with 18 officers dying, followed by March and October, with 13 deaths each. The most recent death by assault is that of Officer Charles Kondek who died on Sunday, Dec. 21. Kondek was shot while responding to a noise complaint call, then run over by the suspect's car as he fled the scene. Officer Mark Lawson also died on March 24, 2014 in a vehicular assault. The records show that Larson was flagged down by a woman who said she'd been attacked. When Larson stopped the suspect's car, the man grabbed Larson's arm and dragged him as he sped away. Larson shot the suspect multiple times, but the man rammed Larson into a guardrail, breaking both of his legs and nearly severing his arm. The officer ended up in a ditch. 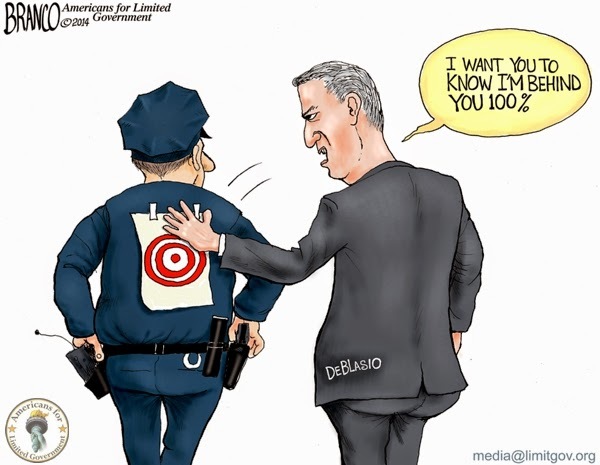 Tags: police, police officers, killed, in line of duty, 46 shot to death, CNS News, editorial Cartoon, AF Branco, NY police, targets To share or post to your site, click on "Post Link". Please mention / link to the ARRA News Service. and "Like" Facebook Page - Thanks! 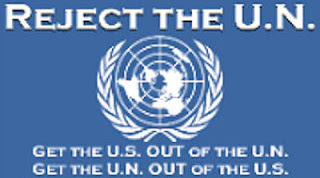 by Alan Caruba, Contributing Author: The right of Israel to exist as a nation was officially recognized by the United Nations on November 29, 1947 when it adopted Resolution 181 favoring the partition of the area claimed by the Zionist movement. The resident Arabs refused to accept the land set aside for a "Palestinian" state. 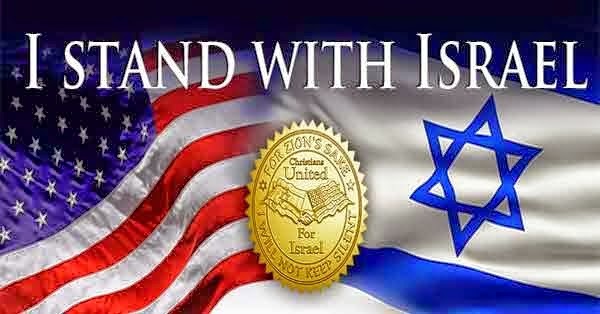 Tags: Israel, UN, Destroy Israel, not going to happen, Alan Caruba, Warning Signs To share or post to your site, click on "Post Link". Please mention / link to the ARRA News Service. and "Like" Facebook Page - Thanks! What insurgent can break the establishment winning streak? Drs. 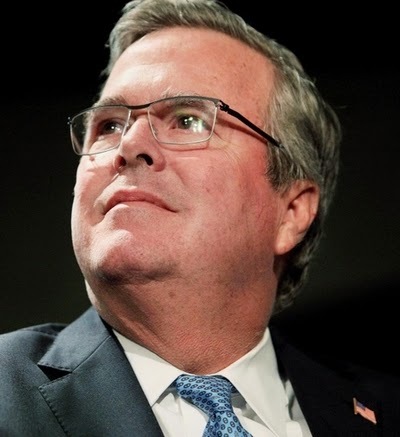 David Corbin and Matthew Parks, Contributing Authors: Those who are not ready for Jeb or Mitt (much less Hillary) are now officially on the clock–tasked with finding a credible conservative insurgent capable of going toe-to-toe with the Republican establishment’s favorite in the primary elections that begin fourteen months from now. The clearest path to victory for the establishment, as they have publicly made clear, is to rally around one high profile candidate while conservative and libertarian-leaning Republicans divide themselves among a half dozen or more until the early primaries begin to cull the field. A divided right and a (more) united middle has carried the establishment to victory in every open primary since the contemporary system emerged (in 1988). As Josh Kraushaar argued last week at the National Journal, such a program is unlikely to energize the Republican base. But the base won’t matter if the Republican establishment standard-bearer can win the early primaries and caucuses with 30-40% of the vote and build an air of inevitability around his nomination before the campaign hits the states where most of that base resides. Meanwhile, renewed rumblings about the end of the Ames, Iowa, straw poll (related to new Republican National Committee rules to discourage party-sponsored voting events prior to the official Iowa caucus) and plans to limit the number of pre-primary debates make the early unification of conservatives all the more unlikely. Last week, we proposed calling a series of regional pre-primary caucuses featuring candidate debates and straw polls (sample below) that would openly, fairly, and naturally work to unite conservatives behind a single insurgent candidate several months before the primaries begin. The idiosyncrasies of the early-voting states would still favor the establishment candidate, but he’d have to get something close to a majority of the vote to defeat a conservative/libertarian insurgent who had established himself as the clear choice of the non-elite. What sort of an insurgent could run this gauntlet and break the establishment winning streak? Being willing to take on the Republican branch of America’s ruling class would be a good start. But that could be the pathway for demagogues and attention-seekers as much as true republicans. The test will be in the alternative he advocates. After eight years of President Obama, we expect the establishment candidate to talk about reform, but we hope an insurgent reformer would bend us toward more constitutional government, not merely more efficient government. A true reform candidate would be able to highlight the important difference between the American presidency as first conceived, and the celebrity, hegemonic, mind-everyone’s business executive that the position has become, to the discredit of both the office and the country. A responsible leader, realizing his ambition in directing an executive branch that serves a self-governing people: an office-holder ever accountable for his actions, who is a judicious representative of the people, not their impassioned and impassioning mouthpiece, attuned to the “deliberate sense of the community.” (67-69, 71-72, 76-77). President Obama’s greatest contribution to reviving the American republic has been his blatant disregard for this model–standing in such a stark contrast to the original that it has drawn our attention back to it. He is not the first to have left the Founders’ republican ideal behind. But he has been the most audacious in trying to hammer the nails into its coffin. He has usurped legislative authority time and again and then threatened to use his veto to prevent the reassertion of Congress’s constitutional powers. He has undermined our peace by suffering injury to American interests from one rogue state after another and exacerbating our political, economic, and racial divisions. He has expanded government power and bureaucratic discretion while leading an executive branch that views the defenders of self-government with suspicion and disdain. There is enough low-hanging fruit here for any ambitious Republican. Criticizing President Obama on the 2016 campaign trail will be easy and, so long as his approval ratings remain low, politically cheap. But whatever measure of political success another not-Obama campaign might bring, it will take the persuasive presentation of a compelling alternative to begin the revitalization of our republic. Who among the current Republican contenders is best positioned to make the case for this understanding of the American presidency–and then live up to it in office? The combination of intellectual and moral virtues necessary to accomplish this is difficult to find. Add the administrative gifts necessary to govern well and the task becomes more difficult still. We hope that over the next year there will be a very robust and public debate centered on this question, despite the efforts of the GOP establishment. Let’s start today. Who do you think is best able to re-constitutionalize the presidency? Participate in our straw poll and add your comments below. Tags: Congress, Hamilton, Jeb Bush, Mitt Romney, National Journal, President Obama, Republican, The Federalist Papers, David Corbin, Matthew Parks To share or post to your site, click on "Post Link". Please mention / link to the ARRA News Service. and "Like" Facebook Page - Thanks! divisive-hate speech toward law enforcement. 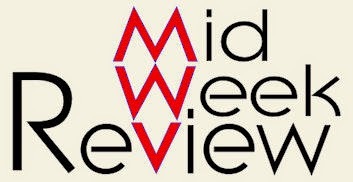 by Herman Cain: His way or the highway! As President Obama continues his series of executive actions, each time is a slap in the face to the people who strongly disagrees with his actions. It's one thing to hold the minority opinion on an issue, but Obama has shown that he doesn't even care about the majority opinion. It's all about what he thinks. Period! Clearly, the president can set the tone on any issue and drive the national media narrative. But setting the tone on an issue with executive actions or memoranda does not produce closure on an issue. Closure requires actions by the Congress, which President Obama tries to ignore and avoid, just as, most of the time, he ignores the majority opinion of the people. President Obama stated that even though he was not on the November 2014 ballot, his policies and agenda were on the ballot. Yes they were, and they were soundly rejected by the electorate even as most Democrats tried to distance themselves from them. He took it as a sign that he must proceed with as much unilateral action as he could get away with. Immigration. Shielding about five million illegals in this country from deportation has only made the problem worse, with an almost-dare to the Congress to stop him. The Obama administration couldn’t care less about unintended consequences, because they might obscure the perception of making things better. Obama’s immigration declaration has set up a head-to-head confrontation with the incoming Republican-controlled Congress. If he does not get the closure he wants, he will simply blame the Republicans again, or claim victory anyway while the legal challenges try to catch up with his executive branch over-reach. Cuba. President Obama announced last week that the United States is beginning talks to normalize full diplomatic relations with Cuba. He said, “I do not believe we can keep doing the same thing for over five decades and expect a different result.” That's what Cuba did, and Obama blinked first on our behalf. The Cuban-American population is split on Obama's announcement. Many people, such as Senator Marco Rubio, are outraged because Obama's intent ignores the sacrifices many Cuban-Americans have made to help bring about freedom, liberty and justice for the people of that island country. Obama's announcement also ignores decades of human rights abuses, about which the administration is now ready to look the other way for the sake of making history. There's good history and bad history, and a majority of our nation view this intent as bad history. But Obama and his administration do not care what we think. Racial tensions. This tempest, encouraged every step of the way by the mainstream media, have not been helped by Obama or his administration over the last few weeks in reaction to the unfortunate deaths of Michael Brown in Missouri and Eric Garner in New York. President Obama believes these incidents are the result of some deep-rooted racial problems we have in America, while ignoring that both men broke the law and resisted arrest. Yes, there are some unanswered questions in the minds of people who were not privy to all of the evidence and witness testimonies, but the administration made no attempt to describe these incidents as exceptions rather than the rule. It was a slap in the face to the overwhelming majority of good and well-intended law enforcement professionals that work every day to protect us. Space and patience does not allow describing all of Obama’s affronts against the majority opinions of Americans, such as the toothless climate change agreement with China, but we must not leave out ObamaCare. Poll after poll has shown that the majority of Americans believe ObamaCare should be repealed and replaced, because millions of Americans have been adversely affected. The Obama administration's reaction has been to forge ahead anyway, figuring the people and businesses will get used to it and adapt, and history will thank them later. History will not be that naive or stupid. History usually presents the painful truth, rather than a slap in the face. Tags: Hermain Cain, three examples, Ignoring the Will of the People, immigration, Cuba, racial tension, Editorial cartoon, AF Branco To share or post to your site, click on "Post Link". Please mention / link to the ARRA News Service. and "Like" Facebook Page - Thanks! 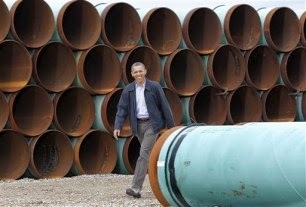 by Jennifer A. Dlouhy, FuelFix: President Barack Obama offered a dim view of the proposed Keystone XL pipeline on Friday [Dec 19, 2014], casting it as a project with big gains for Canadian oil producers but few tangible benefits for the United States. Obama’s remarks in a pre-holiday news conference at the White House came as Nebraska’s highest court weighs a challenge of the pipeline’s proposed route through the state. With his comments, Obama sent the strongest signal yet that he is unlikely to authorize the pipeline after a State Department review or in response to legislation forcing his hand next year. Obama doubled down on his previous observations on Keystone XL, including his skepticism of the potential jobs that would be created or sustained by the $8 billion TransCanada Corp. project. Last year, Obama said it would be a “blip” in the U.S. economy and create “maybe 2,000 jobs” during construction. Although the State Department said Keystone XL would support roughly 42,000 jobs, some of those would only be indirectly supported and others would last only for the duration of construction, spanning about two years. TransCanada has said about four dozen workers would be required to keep the pipeline running later. If authorized and built, Keystone XL would run 1,170 miles from Alberta to Steele City, Neb., giving Canada’s oil sands crude a vital link to a Midwest oil hub and other pipelines that could ferry it to Gulf Coast refineries. Supporters argue that the pipeline would boost the U.S. economy while while weaning the country off Venezuelan and Middle East oil. But Obama said some of those claims have been exaggerated. The State Department, which is tasked with deciding whether the border-crossing pipeline is in the national interest, has put that evaluation on hold while the Nebraska Supreme Court ruling is pending. That decision is expected early next year. Obama emphasized that the State Department will have the information it needs to decide on the project once the Nebraska court rules. But the president could face a decision on the project before then, if congressional Republicans have their way. Senate Majority Leader Mitch McConnell is putting legislation to authorize Keystone XL at the top of the chamber’s agenda next year, with plans to take up the bill in January. The project is a flashpoint in bigger battles about fossil fuels and climate change. Because the bitumen Keystone would carry is harvested from Canada’s oil sands using mining and other energy-intensive steam-based techniques, environmentalists say the resulting heavy crude has a bigger carbon footprint than alternatives. TransCanada argued Friday that Keystone XL is good for refiners and consumers in the United States. Project backers also stressed that U.S. companies have a substantial footprint in the oil sands. The American Petroleum Institute said that at least 2,400 American companies in 49 states are already involved in Canada’s oil sands development. Tags: American Petroleum Institute, api, Barack Obama, Keystone, Keystone XL, KXL, magic formula, news conference, Obama, President Barack Obama, Sabrina Fang, Transcanada, TransCanada Corp To share or post to your site, click on "Post Link". Please mention / link to the ARRA News Service. and "Like" Facebook Page - Thanks!